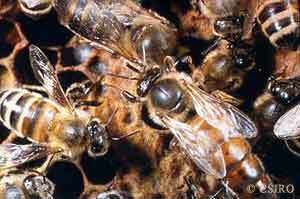 The larvae of hymenopterans lack many of the above external features. They vary in body shape and size depending on the species. Some display a distinct head,a thorax with 3 pairs of legs and an abdomen, although most are grub-like with no legs. The wing hooks of Hymenoptera enable the wings to be coupled together during flight, which gives these insects well controlled, rapid flight. 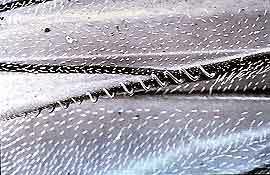 These tiny hooks can be easily seen with the aid of a dissecting microscope. The mouthparts of bees have been slightly modified to form a long tube and a hairy tongue which is used for sucking up nectar from flowers. The mouthparts of honey bees are classified as chewing and lapping types and consist of a pair of mandibles on either side of the head and a long tongue. 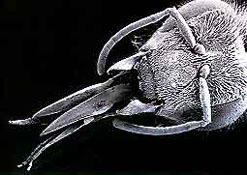 The Hymenoptera is divided into 2 suborders. The Symphyta (sawflies) who have no discernible waist and the Apocrita (ants, bees and wasps) who have a distinct waist. The Hymenoptera are quite a distinctive order and members are unlikely to be confused with other insects. Some of the smaller winged species may appear to only have 1 pair of wings and may be mistaken for flies (Diptera). Sawfly larvae are very caterpillar-like in appearance and may be mistaken for caterpillars (Lepidoptera). Hymenopterans have a complete life cycle, which varies slightly depending on the species. Some females can produce young without mating, while others can store sperm and spread out their egg laying to coincide with available food. Most species will lay their eggs on the appropriate host plant or on paralysed food sources they have gathered into specially constructed nests. A variation of this occurs with social insects such as ants and bees, where special castes provide food for the developing larvae. The larvae will moult several times before they pupate. Development may range from a few weeks for some parasitoids, to much longer in social species. Hymenopterans feed on a wide range of foods depending on the species. 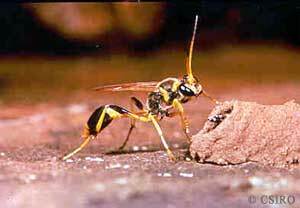 Adult wasps mostly feed on nectar and honeydew and can often be seen at flowers. Some species are predators or parasites and spend their time searching out invertebrate hosts to lay their eggs on. The feeding habits of adult ants vary and may range from specialist to generalist predators, scavengers and omnivores, to seedeaters, fungus feeders or honeydew feeders. Hymenopterans are found in nearly all terrestrial habitats throughout Australia and may occur in soil, leaf litter and a range of vegetation types, especially flowers. Some species are often observed drinking at the edges of water or gathering mud that is used to construct nests, often in man-made environments. For information on some of the more common species of Hymenoptera in Australia visit the Entomology Fact Sheets pages.